March | 2015 | Sonic Smash-Music! The songwriter and performer of music known as Stephen Lantz has released his latest instrumental single, “High Sonority.” The track has been proudly published independent of the mainstream, corporate music industry and distributed to more than 750 online music stores worldwide. 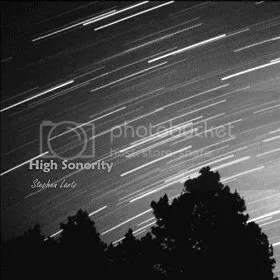 A masterpiece of acoustic guitar work backed by vibrant bass lines and arranged with expert composition, “High Sonority” is an upbeat instrumental that sets a top-shelf standard of high sonority, indeed. Stephen Lantz cites as main musical influences some of the best pop and rock artists of the 1960s and ’70s, such as Peter, Paul and Mary, the Eagles, the Beatles, Willie Nelson, John Denver, and the Grateful Dead. Fans of these will appreciate the precision with which Lantz plays, a rare quality to find in new rock and pop music in recent years. His ear for planning chord progressions which sound natural yet unpredictable at the same time is also of note, marking him as an independent songwriter to watch closely. The artist responsible for “High Sonority” can clearly make music of this caliber at will. That “High Sonority” succeeds in this should not come as a surprise when one considers Lantz’s pedigree, as well as his veteran status as a longtime live player. Here’s hoping he stays in a long, long time. “High Sonority” by Stephen Lantz is available online worldwide beginning 2 April 2015. 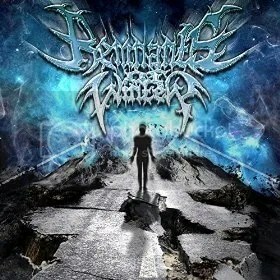 The writers and performers of heavy metal known as Remnants of Winter have released their debut self-titled LP record, “Remnants of Winter.” The record has been proudly published as an independent release without the interference of the corporate music infrastructure. The album comprises eight original tracks for approximately 30 minutes listening time. Melodic, evocative, and boasting equal parts aggression and imagination, “Remnants of Winter” by Remnants of Winter is a striking example of metal’s relentless spirit in sheer and undeniable force. Remnants of Winter cite as main artistic influences Taake, Wintersun, Burzum, Ulver, Amesoeurs, Uaral, Woods of Ypres, Jesu, Peste Noire, and Alcest. Their own style and tone shares qualities with all these, though the real power of their music comes from a rare mix of pain, strength, and darkness. The heart of Remnants of Winter are a duo from New York and New Jersey respectively, Joe Cantamessa (instruments) and Matt Storm (vocals and lyrics). The interaction and camaraderie between them forms the crux of what differentiates Remnants from other popular independent metal groups of today, as does the unusual, unfortunate circumstances surrounding the inception of their project. The near-death experience they casually mention is not that of an imaginary person, but rather, that of Storm, himself. Their current bio includes that Cantamessa and Storm played live together in 2010-2011 while Cantamessa filled in for an absentee guitarist. In time that particular band broke up. It wasn’t to be the most tragic part of Storm’s year. Storm was diagnosed with a crippling stomach disorder and extreme anxiety shortly thereafter. His weight fell below 100 lbs. He nearly succumbed. A temporary solution was implemented, however, which granted Storm a much-needed reprieve, and in 2013 he began talking with Cantamessa on a more regular basis over social media. Cantamessa had some songs written, the project for which he called Remnants of Winter. Their musical chemistry made them prolific, and in spite of a four-hour drive which made live sessions unlikely, they completed the resulting album by recording in separate home studios. Who knows, indeed? But one fact remains unimpeachable: the arresting narration, staggering creativity, and soul-wrenching sonic currents thrumming in the “Remnants of Winter” LP stand as rock-hard evidence that metal music can be a frighteningly sharp sword that heals. “Remnants of Winter” by Remnants of Winter is available online worldwide beginning 31 March 2015. 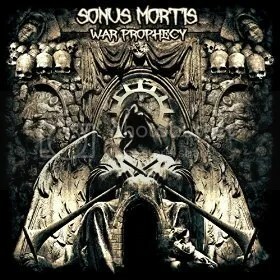 The mastermind of melodic death metal internationally known as Sonus Mortis has released his latest LP record album, “War Prophecy.” The LP has been independently published without the managerial or financial support of the corporate music industry. Boasting 15 all-new, original tracks to slake the thirst of fans new and old, the collection offers approximately one full hour of the grittiest heavy metal the world has to offer. Brutal, richly imaginative and extremely well-orchestrated, “War Prophecy” from Sonus Mortis is an album no true death metal fan should go without. Even without taking his freshman LP release, the equally intense “Propaganda Dream Sequence,” into consideration, Sonus Mortis is no newcomer to death metal. Hailing from Dublin, Ireland, he is an alumnus of the popular Irish melodic death metal band, Valediction, which was powerfully active from 2005-2011. The crew performed with bands such as Firewind, Amon Amarth, Thurisaz, Vreid, Desaster, Blaze Bayley, Wizard, Mael Mordha, Diamond Head, Cruachan, and Coldwar and a great many others. Sonus Mortis records his music at the famous Trackmix Studios (Coldwar/Cruachan/Mael Mordha, et al) in Dublin. His first, three-track demo was freely released in July of 2013 and continues to collect hundreds of downloads. His debut LP record, “Propaganda Dream Sequence” was received with uproarious and uniform acclaim in the UK, Italy, Austria, USA, Germany, Poland, Japan, Switzerland, Singapore, and Russia, in addition to his home nation of Ireland. “War Prophecy” represents his most highly anticipated official release to date and has already garnered new Sonus Mortis fans from death-metal scenes around the world. “War Prophecy” by Sonus Mortis is available online worldwide. Get in early, death-metal fans. 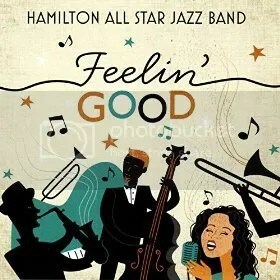 The great northern jazz collective known as the Hamilton All Star Jazz Band have released their latest LP record, “Feelin’ Good.” The album has been published as an independent release and offers 11 classic jazz tracks for an approximate total listening time of 45 minutes. A sparkling potpourri of jazz, blues, and gospel songs from one of the most distinguished and best-loved ensembles ever founded, “Feelin’ Good” by the Hamilton All Star Jazz Band is easily the most remarkable jazz LP to be released in spring of 2015. Gershwin, Gillespie, Nat King Cole, Aretha Franklin – these names demonstrate the caliber of music played by the Hamilton All Star Jazz Band, who celebrated their 30th anniversary as a group in 2014. “Feelin’ Good” features lead singer and soloist Candace Walkes. It is the ninth official studio production from the band. As one might infer from the word ‘graduates,’ the Hamilton All Star Jazz Band is not your everyday orchestra belting out big-band favorites. The organization has been home to nearly 1,000 young musicians in its history. Neither have these musicians gone unrewarded for their talents and performances. “There have been dozens of nominees and winners of Juno and Grammy Awards, as well as multiple winners of local Hamilton Music Awards,” writes Dr. Knechtel. Based in Hamilton, ON, the Hamilton All Star Jazz Band was started 31 years ago by Dr. Russ Weil. It is one of Canada’s premier amateur big-band organizations. The Hamilton All Star Jazz Band have been regular performers at the world-famous Montreux Jazz Festival in Switzerland, and played for Prime Ministers, Governor Generals, and even the Queen of England. At the request of the Federal Minister of Culture they have performed at the Canadian Ambassador to France’s personal abode in France, as well as at the Juno Beach War Memorial in Normandy. The Hamilton All Star Jazz Band also headlined the spectacular performance at Saint-Dié-des-Vosges, France for the 400th anniversary of the naming of the Americas by the scholars of Ste. Die. “Feelin’ Good” by the Hamilton All Star Jazz Band will be available online worldwide starting 1 April 2015. Get in early, jazz fans. The composer, producer and performer of epic-scale rock music known as J.S. Tolar has released his latest single, “Ghost Within.” The track has been proudly published as an independent release without the financial or managerial support of the corporate music industry. Boasting nearly 10 minutes of highly narrative and immersive music, “Ghost Within” from J.S. Tolar not only approaches the depth and scope of an EP in its own right, but easily succeeds as one of the most significant rock singles of Q1 2015 at large. J.S. Tolar has cited as main artistic influences Dream Theater, Riverside, Lunatic Soul, Pineapple Thief, Porcupine Tree, and Katatonia. As might be inferred from this eclectic, distinguished list, his own music has a high amount of ambient texture and an even more prominently deliberate composition. 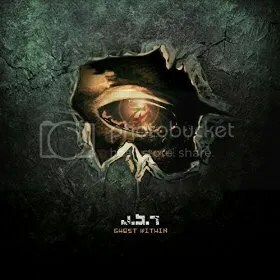 Melodic, fecund, extremely atmospheric and approaching the epic scale of the great rock operas in terms of both storytelling and emotional impact, “Ghost Within” is as intriguing as it is immediately effective, as arresting as it is fascinating. J.S. Tolar has been playing music since middle school, when he began on the violin. He traded this for what he has described as “a pawn-shop acoustic” guitar in high school, and quickly graduated to a Gibson Epiphone. This led him to join a plurality of bands who, along with musicians such as Steve Vai and Joe Satriani, helped him sculpt his style and musical character. He published his towering debut LP, “The Continuum,” in January of 2014. His sophomore project, “Endless War,” is rumored to appear early in 2016. “Ghost Within” by J.S. Tolar is available online worldwide now. Get in early, fans of prog rock and metal alike. Very early. Be sure also to visit his official website for music, artwork and more (link provided below). 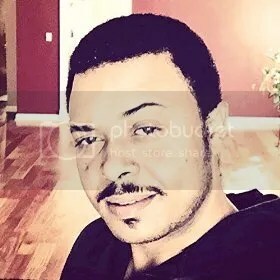 The singer and songwriter known as Ralston Calder has released his new R ‘n’ B single, “This Dream.” The track has been proudly published as an independent release without the financial or managerial support of the corporate music industry. Evocative, sonorous, and powerfully moving, “This Dream” by Ralston Calder is a rhythm-and-blues song fans of the sound will want to hear all over the world. Ralston Calder cites as main artistic influences such titans of music as Bob Marley, Michael Jackson, Prince, Beres Hammond and Stevie Wonder. His own style and tone on “This Dream” have most in common with the latter two, and work as a facile blend. His natural singing voice is not unlike Hammond’s, while his songwriting is reminiscent of Stevie Wonder’s more tender moments. Regrettably, the pathos with which he sings his new single, “This Dream,” is absolutely unfeigned. Ralston Calder was born and raised in the parish of St. Catherine on Jamaica. He has described his music style as a mix of R ‘n’ B, reggae, and hip-hop music. He has been writing songs since he was a young man. The encouragement was the catalyst which has led to Calder’s “This Dream” single, and to other tracks as well. “With a little help from my friends, I started my journey,” he writes. Ralston Calder now lives, writes, and records his music in New York. “This Dream” by Ralston Calder is available online worldwide. 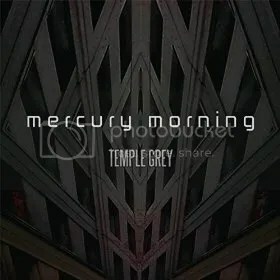 The alternative rock crew known as Mercury Morning have released their new EP record, “Temple Grey.” The EP has been proudly published on the band’s own eponymous, independent label without support or adulteration from the corporate music industry. Comprising four original tracks for an approximate listening time of 16 minutes, “Temple Grey” represents a roundly comprehensive treatment of this powerful, pop-charged alt-rock group from New York City. Music by Mercury Morning evokes a colorful and textured range of emotion. It sounds loud no matter how low the volume on the stereo, achieving a live feel and tone which pulls the listener into the music and infuses him or her with adrenaline. The band cites as musical influences artists reflecting their respective instruments and characters. These include Thom Yorke and Chino Moreno, the Cinematic Orchestra and the Mars Volta, Robert Fripp and Paul Masvidal, Secret Machines and Frightened Rabbit. While the styles and tones of each are widely varied of course, the true audiophile will quickly note the consistent thread of high quality running throughout the list. The resulting “Temple Grey” EP will come as no surprise to such a listener. Their “Temple Grey” EP is the band’s fourth extended-play record release. Recorded by the band, themselves, it was mixed by Ted Young and mastered by Jessica Thompson. “Temple Grey” by Mercury Morning is available online worldwide. Get in early, fans of alt- and indie rock. Very early.